We’d love your help. Let us know what’s wrong with this preview of A Matter of Justice by J.C. Long. To ask other readers questions about A Matter of Justice, please sign up. This is the third book in the series and picks up pretty much right after book two ends. The Dragons are close to an all out war with a rival gang and the tensions are mounting. Conroy is in a club one night when he witnesses a murder that puts him right in the cross hairs. This leads to him needing police protection (against his will) and Wei decides it's best if Conroy stays with Allen. Neither Allen or Conroy are happy about their new situation. The two have a very complicated past and Conroy can't let go of his hurt and resentment. Allen wants things to be different but has pretty much accepted that the Dragons hate him & while he's not happy with it, he'll deal with it as long as Conroy is safe. The story is fast paced and super entertaining. Lot's of stuff happens in this one. I really like the ongoing plot and I like how the author weaves in characters from past books so that we get updates on them. I'm excited to see where the story will go. Seems like big things are ahead. Overall I enjoyed this. Again, I think it's a really good series and I would love to see more people pick it up. It's a must read for those of you who like romantic suspense stories. The conflict between Conroy Wong and Allen Hong still looms heavily. Conroy and Allen have a history; they were both Dragons and are former lovers who had good intentions but different views on where they would fit best in protecting the people of the Eastern District. After the war and the fall of the Nine Stars, Conroy stayed loyal to the Dragons, and Allen decided to join the Hong Kong PD. The criticism he received from the leader of the Dragons, Wei Tseng, also led Allen to form his own thou The conflict between Conroy Wong and Allen Hong still looms heavily. Conroy and Allen have a history; they were both Dragons and are former lovers who had good intentions but different views on where they would fit best in protecting the people of the Eastern District. After the war and the fall of the Nine Stars, Conroy stayed loyal to the Dragons, and Allen decided to join the Hong Kong PD. The criticism he received from the leader of the Dragons, Wei Tseng, also led Allen to form his own thoughts on how Conroy would react, and he left Conroy without an explanation. On a night out at his favorite karaoke bar, Conroy plays witness to the murder of Inspector Yang, who has been working diligently to bring down Johnnie Hwang and his Twisted Vipers. Now, with Hwang behind bars, the situation becomes even more dangerous. Those who want to be the next leader of the Twisted Vipers are now after Conroy, so Allen puts his life on the line for Conroy and takes him under protection. But, Conroy being younger than Allen, he’s sometimes full of himself and gives Allen a very hard time. He has never gotten over what he feels is Allen’s betrayal of the Dragons and himself. Allen also carries guilt, not just about Conroy but his brother-in-law too, whom he couldn’t protect. Allen, Conroy, and Wei have had their suspicions all along about corruption in the HKPD, and Allen finds himself under investigation. With more devastation from the Twisted Vipers aimed at Conroy and the people of the Dragons territory, the fear is real that another war with a triad could destroy them all. J.C. Long has created a roller coaster ride of a story in A Matter of Justice, with action, suspense and danger. The plot is intriguing and a shocker when all the pieces started to fall into place. The storyline also gives a more in-depth look at the Eastern District and the different triads that could cause a brutal takeover. As for Conroy and Allen, there’s a lot for them to work out, so this isn’t exactly a HEA. The ending leaves some doors open for the next novel. It will be interesting to see how things develop between them. There’s a good, solid group of secondary characters, most of whom are members of the Dragons. For me, Tony Lau, who is a member of the Dragons with forty years of hard life on the streets, and Ao Cheung, Allen’s partner at the HKPD were very impressive throughout this story. I highly recommend reading the Hong Kong Nights series in order, as I don’t see this as a standalone. There is just too much history you’ll need before getting to this point. As for me, I remain impressed with J.C. Long’s creativity in this all-around exciting series. The third in the series is just as fascinating and intense as the other two. This time it is about Conroy , his relationship with Allen and their past. It also deals with the possibility of war between the Dragons and the Vipers. The hallmark of this series is it's complex characters, playing out in the intriguing city that is Hong Kong. I wish this series got more press as it is one of the best I've read in a long time. I didn't really get along with the first book in this series, but reunited lovers is a trope that’s a weakness of mine, so I decided to give this a go. I didn’t enjoy it as much as I thought I would, unfortunately. I think I was lacking context about Allen and Conroy’s past relationship, so I never felt as strongly about their present day feelings as I wanted to. It was also broke immersion for me that the Dragons are a successful triad gang that...doesn’t use guns. To me, it seemed like trying to I didn't really get along with the first book in this series, but reunited lovers is a trope that’s a weakness of mine, so I decided to give this a go. Also, there seemed to be a major continuity error: Conroy notices that Allen has a porcelain Mickey Mouse figurine as a memento of their trip to Disneyland, but later on Conroy and Allen keep referring to a photograph from Disneyland. - It feels like there hasn't been adequate checking that the names used for Hong Kong characters are actually in Cantonese. “Inspector Yang” is Mandarin and should be “Inspector Yeung” in Hong Kong. “Ao” is not Cantonese. Is Johnny Hwang supposed to be Korean, because “Hwang” is not a Cantonese last name? Why would characters be confused about Conroy’s last name being Wong or Wang when only Wong is Cantonese and Wang is Mandarin? - “Hanzi” are not called “hanzi” in Cantonese, they’re called “honji”. - My friend, who was born and raised in Hong Kong and not exactly pro-mainland, has told me that unlike what’s claimed in this book, mainland China does NOT suppress religion in Hong Kong. Please do better with fact-checking. - The honorific “siu ze” was not used appropriately. It's not used for any lady you don't know. “Siu ze” is only used to refer to a young woman or service worker, NOT an older woman as used in the book. This is another gripping book in the Hong Kong nights series. The plot has action and suspense in it, I wondered how on earth it was going to be resolved, I couldn't see a way out. Conroy and Allen's past and the conflict they still feel is bound up in the dramatic part of the storyline as they struggle with what is loyalty and what is betrayal in the complicated world they live. Who are the heroes and who are the villains is unclear and sometimes people are a bit of both. I really enjoyed readi This is another gripping book in the Hong Kong nights series. The plot has action and suspense in it, I wondered how on earth it was going to be resolved, I couldn't see a way out. Conroy and Allen's past and the conflict they still feel is bound up in the dramatic part of the storyline as they struggle with what is loyalty and what is betrayal in the complicated world they live. Who are the heroes and who are the villains is unclear and sometimes people are a bit of both. J.C. Long does it again! Inspector Allen Hong was my favorite secondary character in the previous Hong Kong Nights books, so I was very eager to read a new book with him as one of the main characters. I'm happy to say that I was not disappointed. Once again, the tense romantic plot is woven seamlessly with high-stakes action and suspense. Allen and Conroy's past feelings resurfacing amid danger and strife, their reluctant push and pull that gradually evolved into something deeper, really strike a J.C. Long does it again! Once again, the tense romantic plot is woven seamlessly with high-stakes action and suspense. Allen and Conroy's past feelings resurfacing amid danger and strife, their reluctant push and pull that gradually evolved into something deeper, really strike a cord. I also enjoyed meeting all the familiar characters again, especially Wei and Noah. It was a wild ride and I loved every minute of it! 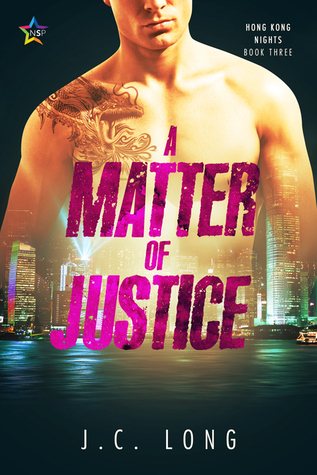 From that review: " A Matter of Justice (Hong Kong Nights Book 3) by J.C. Long is a tense, complicated and terrific novel. Gritty and intense, it delves into the corrupt landscape of triads, gang wars and bought cops in Hong Kong. Throw in a old wounded romance between a triad member and a detective and all the elements are there for one memorable story. Which is exactly what Long gives you." A captivating read that takes you to Hong Kong and its criminal underworld. It's a second chance romance for Conroy and Allen who spent many years apart but are now spending time together and discovering that their love and attraction have not faded away. They have to struggle with the fine line between loyalty and betrayal in this story that's full of action and suspense. loved this book, but i love a good crime good/bad guy story. this book was fast paced and fun to read. I loved Conroy and Allen, would love to read more of their story, or even a different couple...would def recommend!